According to the information you provided, your company is performing well in all four areas of the assessment. Check out the resources below to learn how Microsoft Enterprise Mobility + Security may be able to provide your company with even better mobile management and protection. According to the information you provided, your company is performing well in three of the four areas of the assessment. Here are some resources to show you how Microsoft Enterprise Mobility + Security can help address the gaps. According to the information you provided, your company may be at risk in 2 of the 4 areas of the assessment. According to the information you provided, your company may be at risk in 3 of the 4 areas of the assessment. According to the information you provided, your company may be at risk in 4 of the 4 areas of the assessment. Your company may benefit from even more efficient device management tools. 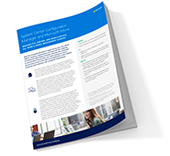 Learn how Microsoft Enterprise Mobility + Security can help streamline management of both employee-owned and company-owned devices—all from a single console. Your company may benefit from a more efficient way to manage multiple types of devices and device platforms. Learn how Microsoft Enterprise Mobility + Security can help streamline management of both employee-owned and company-owned devices—all from a single console. You may benefit from an even more centralized identity management system. Learn how Microsoft Enterprise Mobility + Security can help you centrally manage identities across your datacenter and the cloud while providing users with the convenience of self-service password reset and secure single sign-on to all your applications. You may see significant costs savings and increased productivity benefit from a more centralized identity management system. Learn how Microsoft Enterprise Mobility + Security can help you centrally manage user identities across your datacenter and the cloud while providing users with the convenience of self-service password reset and secure single sign-on to all your applications. Your company may be able to provide even better protection against an increasingly sophisticated attack landscape. Learn how Microsoft Enterprise Mobility + Security can help you control suspicious activity using behavioral analytics, deeper monitoring, and stronger controls. Your company may be at risk of increasingly sophisticated attacks to data and user passwords. Learn how Microsoft Enterprise Mobility + Security can help you control suspicious activity using behavioral analytics, deeper monitoring, and stronger controls. Your company may benefit from data protection tools that are even easier for both administrators and employees to use. Learn how Microsoft Enterprise Mobility + Security can help you and your employees classify data based on sensitivity and apply persistent data protection to your most critical assets—both inside and outside your organization. You may be at risk of employees accidentally leaking company data. Learn how Microsoft Enterprise Mobility + Security can help you and your employees classify data based on sensitivity and apply persistent data protection to your most critical assets—both inside and outside your organization.